Tomorrow, Nov. 30, is “National Stay Home Because You’re Well” Day.” What a delightful idea. “Hello, Boss. I won’t be in today. I’m too well!” Everyone knows we work too hard. Our European counterparts work an average of six hours a day and many of them take the month of August off. We’re on board with today’s “day.” It may be one of Gildshire‘s favorite days. How did it come to be, though? How do any of the “days” come to be? That’s what we set out to discover. 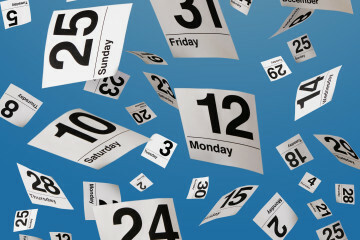 As it turns out, creating a “Day” is less complicated than one might suspect. We thought it took an Act of Congress or at least a Presidential Decree. Neither of the above is true. You can make your own “Day”, in fact. To submit ideas, follow the link to the National Day folks. February: National Baked Alaska Day is Feb. 1. All right! A day to show off your culinary skills by preparing that easiest of all desserts to make, Baked Alaska. After all, what could go wrong with an ice cream dessert you place in a hot oven? April: National Hug a Plumber Day is April 25. Be careful with this one. Make sure the plumber knows you’re behind him and coming in for a hug or you might get the business end of that big wrench thingy. It’s good to remember plumbers, though. They have kept the water running in it’s designated place since the days of the Roman aqueducts. If you know a plumber personally, buy him/her a pair of pants that stay up. May: National Limerick Day is May 12. There once was a magazine Gildshire. Whose readership loved it like Hellfire. We write some good stuff, and we take us no guff, because truth we tell brooking no liar. June: National Repeat Day is June 3. You can say that again. July: National Tapioca Pudding Day is July 15. You know, I’m an understanding sort, but if you don’t like tapioca pudding I’m not sure we can be friends. Its creamy goodness coats the mouth and makes you glad to be alive. I will entertain no discussion to the contrary about this. August: National Frozen Custard Day is August 8. My life changed forever on a warm summer day in 1997 traveling Interstate-94 through Wisconsin. It was then that I was first introduced to frozen custard at a Culver’s. Since then, my tawdry affair with this frozen mound of delightfulness has seen me have a second lunch in Quincy, Illinois when I was wrongly steered to a Maid-Rite instead. Back to back lunches did not make me proud, but it proves a valuable point about frozen custard and the place it belongs in your life. September: National One-Hit Wonder Day is September 25. This isn’t just about music, but celebrating everyone who had one shining moment in the sun. The person who invented the Pet Rock? He or she never saw their star shine so bright. Celebrate temporary fame by singing a rousing round of Love Grows (Where My Rosemary Goes) by Edison Lighthouse, who was never again so famous. O. Henry likes to help me work. October: National Cat Day is October 29. This will come as a surprise to O.Henry. He believes every day is thus. November: National Men Make Dinner Day is Nov. 2. This one is unique because it comes with specific rules. According to the calendar rulebook, grilling or barbecuing is not allowed and the oven and/or stove must be utilized. Presumably, this day would be followed by National Firefighter Appreciation Day. December: National Pfeffernusse Day is Dec. 23. For those not up-to-date on German desserts, pfeffernusse are fluffy cookies made with ground nuts and spices and then covered in powdered sugar. Very important, because there aren’t anywhere near enough cookies floating around in December. Gildshire’s favorite Days may inspire you to find your own. During the holiday season, though try to make every day a favorite. Know too, that you are one of Gildshire’s favorite folks just because you read what we have to say.